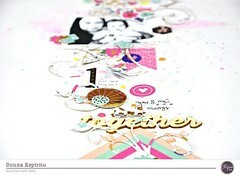 Nathalie with you today to share with you a few of the entries of my journals created with this month’s MALIBU TN kit. The colors of the papers from the Pink Paislee’s Summer Light collection are dreamy, and perfect to document all those vacation, and every day moments. As you all know, our family took a long vacation to Ecuador, which means there are plenty of memories to document. Though i brought some supplies with me, and actually managed to document a large number of our adventures, there were those days, that only got sketched in hopes to finish the page once i got to all my supplies. This is how one of the planned pages of my travel journal looked like down in Ecuador. As you can see I penciled all the story on the right of the page, and actually used the Imaginisce stamp (available at the Clique Store for $1!) to add some hot air balloons to the other page of the tn -most of this pictures were taken on the Gondola ride and up on the mountain at 4100m above sea level, so the air balloons fit the mood-. Since there were so many pictures taken, i wanted to create a collage for this post, which meant that it will have to be finished on my return home. Upon receiving the MALIBU TN kit, i fell in love with one of the papers -since it had this soft blue stripes on it-, as it reminded me of the sky’s color. First i stamped the image at few times on white paper, cut them, and set them apart for a bit. Then using some watercolor, I created a blue background on top of the stamped images, and glued the newly created images on top (this cover all the smudge color inside the air balloons). Next I pulled some of the cloud chipboard stickers from the MALIBU main kit and attached them here and there. The title was then created using the Pebbles alphas from the POOL PARTY kit. My idea to create the collage changed as the paper was added to the other side of the TN. Instead, i opted to use LR to create picture strips which were glued to a piece of vellum cut to fit inside the TN. I folded about 1/4 in on the long side of the vellum so that it could be glued to the tn. A few CK exclusive printables were then added to the strips to bring some interest to the pictures. Since the papers in the MALIBU TN kit are 6x6in, and my TN’s length is of about 8.25in, i had to be crafty to complete the page – i cut some small strips, and added them in the middle of the page. To hide the seam, the journal of this outing was then wrote on plain copy paper with one of the Prima Neon pens, included in this month’s TN kit, and then trimmed, and attached to the center of the page. I really like how easy it was to incorporate the MALIBU kit into my Travel Journal, but it was a pleasant surprise to see how versatile the kit is when documenting every day moments. I love how versatile all CK kits are, but i want to show you how easy it was to document the aftermath of my vacation on my Personal Journal. Since the house was a mess from unpacking all the bags, I opted to convert the picture to black and white. Next I matted the picture with a piece of one of the papers from the MALIBU TN kit, and glued it to the TN insert included in the kit. I fussy cut some of the words, and images from the Pink Paislee papers, as well as the CK exclusives to create the cluster on this page. Though unpacking is never pleasant, i chose to add cheeriness to this memory by combining the tissue paper (that the kits come wrapped with) with this month’s printables, and alphas included in the kit. The color combo matches that of the picture, and brings the spread all together. AS you can see this month’s MALIBU TN kit is not only gorgeous but versatile, too. It can easily be used to scrap all those special summer/vacation memories, as well as those simple every day moments. Remember there is still a few TN subscriptions available, so take some time to visit the Clique Kits website to check all the kits and exclusives. I am a comment away if you have any questions on how these came together. Categories: CK Kits, Field Notes | Tags: CK Exclusives, Malibu TN kit, multiple pictures, Nathalie DeSousa, personal Journal, pink paislee, Summer Lights, travel journal, Travelers Notebook | Permalink. Love your layouts!! I recently started making my first ever Travelers notebook with Photos!! Awesome pages. I love the stamp and all the photos you added! !